That double line goes on for a long way, so settle back and wait. Picture yourself on one of our winding two-lane roads through the hills, and for some reason yours is not the only vehicle on the road. OK, so maybe it is a nice afternoon, and lots of other people are driving home from the beach. The weather is good and the pavement dry, so why is that guy in front driving no more than 40 miles an hour, and why does he get on the brakes for every gentle curve? You are asking yourself this because you know that for the next 30 miles or so, there’s an unbroken double yellow line down the middle of the road. Which means you are going to be stuck in this caravan of road turtles for the foreseeable future. And you wish you could remember if there’s a section of the motor vehicle code that requires drivers to pull over once they have acquired a tail consisting of a certain number of vehicles. From when you learned to drive in the mountains of Southern California — in the middle of the century before this — you vaguely recall that the rule used to be “five.” You see five cars trailing you on a two-lane, you’re supposed to get out of the way and let them go by. No such rule seems to be in force on this particular road on this particular afternoon, or if it does the leader of our parade has not heard of it or is choosing to ignore it. I’m surprised Hasso can pedal his bicycle fast enough to pass cars…!!! These same inconsiderate jerks can be found on the freeway clogging up the left-hand lane. 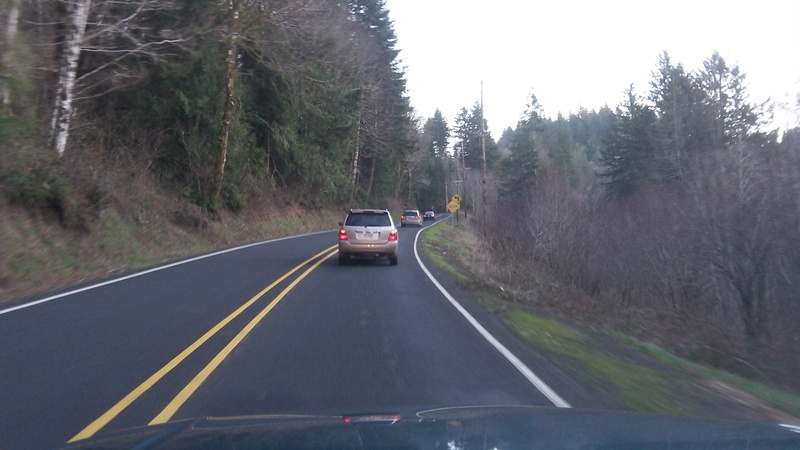 We used to have a “driving lane” and a “passing lane” but that seems to have gone the way of the spotted owl. Especially younger drivers seem to feel its ok to whip back and forth across the traffic lanes to pass anyone at any time. Of course, one can understand their frustration with the above-mentioned “lane-hogs” who refuse to pull to the right. Only us old fuddy-duddies remember the adage to “drive on the right, pass on the left; which does in fact make for a much safer, more orderly, and ultimately quicker trip for all.